Stay Staffed provides businesses with web-based technology for managing open shifts in your organization by utilizing your internal talent pool. Replace administratively burdensome tasks and manual processes with: increased productivity, higher morale, and enhanced productivity with Stay Staffed's Internal Staffing Management (ISM) solution. Stay Staffed solutions are easily implemented. We offer our superb staffing management software services and solutions -- and invite you to see firsthand, how Stay Staffed will dramatically improve your operations immediately. Our Internal Staffing Management solution will help you maximize staffing efficiency and minimize staffing costs. You can post open shifts and your staff can access these positions 24/7. Your employees can select which shifts they would like to pick up and schedule themselves allowing you to streamline your management team's ability to fill positions quickly and efficiently. 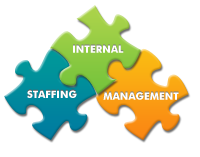 Our clients have found the primary benefit of Stay Staffed Internal Staffing Management solution is that it dramatically decreases the need to hire external sources, increases your facility's ability to fill positions internally, while also increasing the morale of managers and staff alike as it eliminates the high volume of phone calls it takes to fill open shifts. Your employees will appreciate having flexibility to add shifts to their schedule at any time. Our staffing solutions are available to employees from any computer with Internet capability, permitting employees to browse posted positions on a secure site at their leisure. Whether from the comfort of their home or from a computer at work, the Stay Staffed web-based ISM solution will provide your employees with greater control over their schedules, ensuring better employee satisfaction and ultimately it will assist in increasing the retention rate of your staff. This flexible staffing solution will provide assistance in reducing agency costs; enhancing continuity of operations and helping managers avoid making multiple emergency phone calls to find staff. More important than even the financial benefit to your organization is the empowerment given to your most important asset, your employees. The traditional filling of open shifts through manual methods will be a thing of the past as your company offers employees and management a technology solution that is easy to use and implement. Shift Bidding is utilized in selective settings in staffing operations nationwide. It is a method to reduce the actual expense of each shift, resulting in significant annual savings. Organizations utilizing bidding systems have found it also leads to better employee retention. Employees may bid on available shifts in advance of those openings. The candidate submits the lowest hourly rate they will accept for that shift. As bids are received, the manager selects a candidate based upon bid price, seniority, experience or other factors they wish to consider. Once the manager has made a candidate selection, all employees who had bid on that shift are notified via email that the shift has been filled. More savings for you and more freedom for your employees. SmartDocs - provides the ability for all candidate documentation to be viewed on screen. As an example, this feature will assist Healthcare Employers with Joint Commission compliance using its expiration tracking feature which in turn, ensures that Joint Commission audits can be conducted in an organized and efficient manner. This product ensures that managers can project staffing management overtime costs, prior to accepting a candidate to work a shift and choose an alternative employee to lower the staffing and payroll costs associated with that shift. Efficient organization of information on screen will permit you to easily view, track and manage all of the critical details in one simplified report format. Analysis is an easy task allowing management to review reports relating to unit information or overall usage. In addition to having all of details at your fingertips, the clients using our staffing solutions are ecstatic with the additional features such as the ability to produce instant tracking and analytical reports with real time data. Over 30 standard reports are available through Stay Staffed’s web-based management software technology. All documents, reports, and analysis can be viewed online, exported to other reports, or printed in a hard copy. Our Client Representatives are available for an online demonstration taking only 30 minutes or will arrange an on-site visit and personal demonstration of our staffing management software.